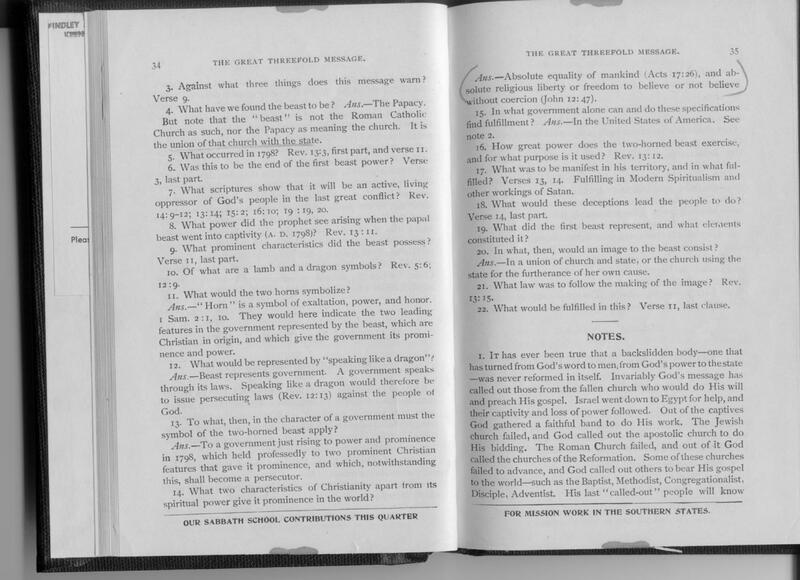 Note to the Reader: The 1896 Sabbath School Quarterly was approved by the General Conference of Seventh-day Adventists and represented the doctrinal position of the church body at the time of publication. 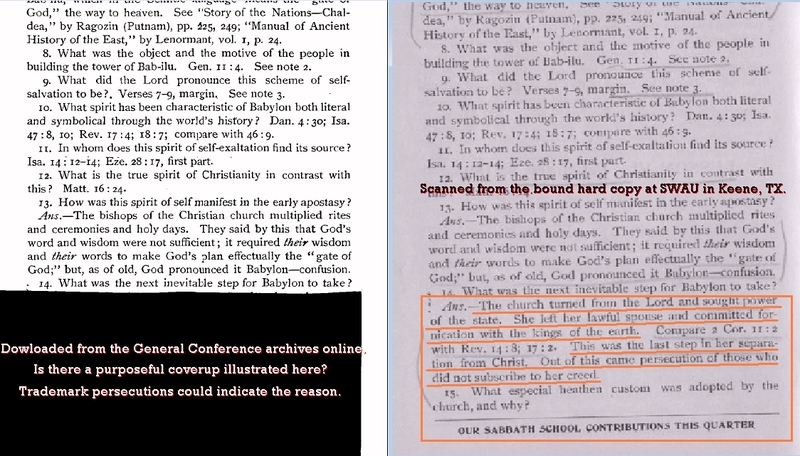 "When the early church departed from God and imbibed pagan errors, she became Babylon. When she united with the state, she fell, and, as an organization, was the body of Christ no longer. While the Reformation churches held fast to the word, Christ was with them. Then they crystallized their various errors into creeds and endeavored thus to confine God's word, they made themselves daughters of Babylon. When some of them united with the state, they fell, and God had to use other people, called out of Babylon to carry forward His work. 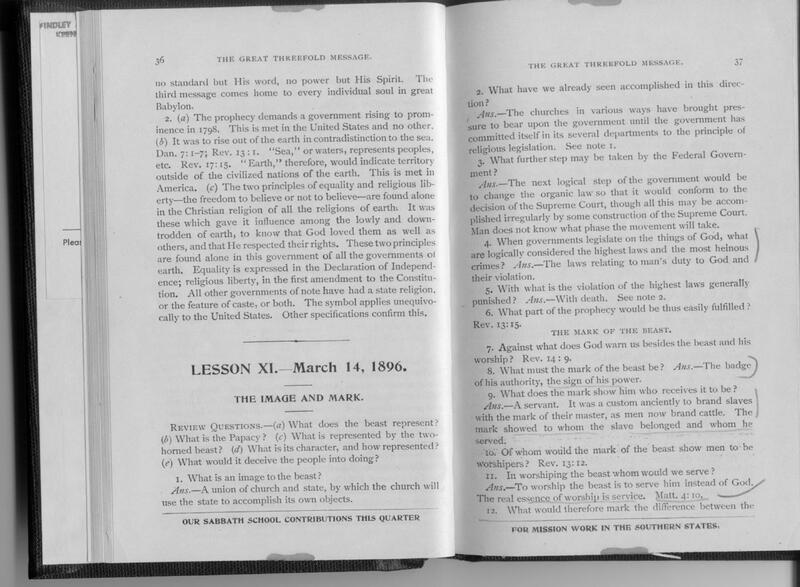 Now [in 1896] among these very churches which came out of the second Babylon, confusion reigns; and now [in 1896] great Babylon, including later daughters, is in adulterous union with the kings of earth , and is endeavoring to make that union stronger. 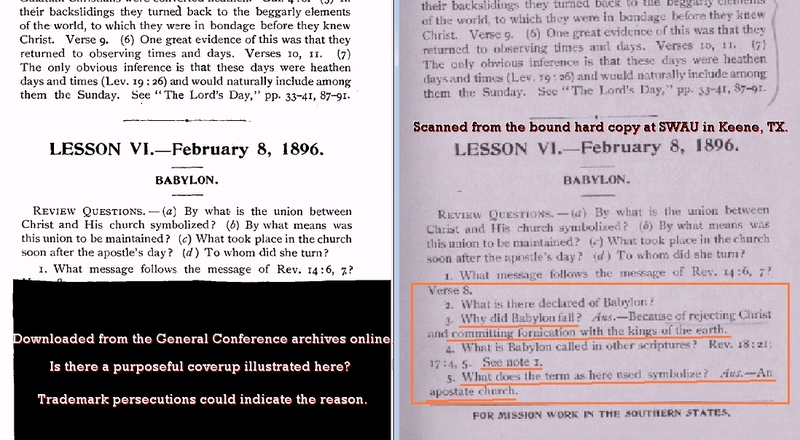 God calls no church Babylon which holds to His word, and follows the light that shines from it, even though there are in its membership many who do not know Christ When the controlling influence of a church is downward, it erects some other standard [27 Fundamental Doctrines/ Trademark Name] besides God's word." All emphases of font color, bold, and brackets supplied at this site. "It has ever been true that a backslidden body, one that has turned from God's word to men, from God's power to the state, was never reformed in itself. Invariably God's message has called out those from the fallen church who would do His will and preach His gospel. Israel went down to Egypt for help, and their captivity and loss of power followed. Out of the captives God gathered a faithful band to do His work. The Jewish church failed, and God called out the apostolic church to do His bidding. The Roman Church failed, and out of it God called the churches of the Reformation. 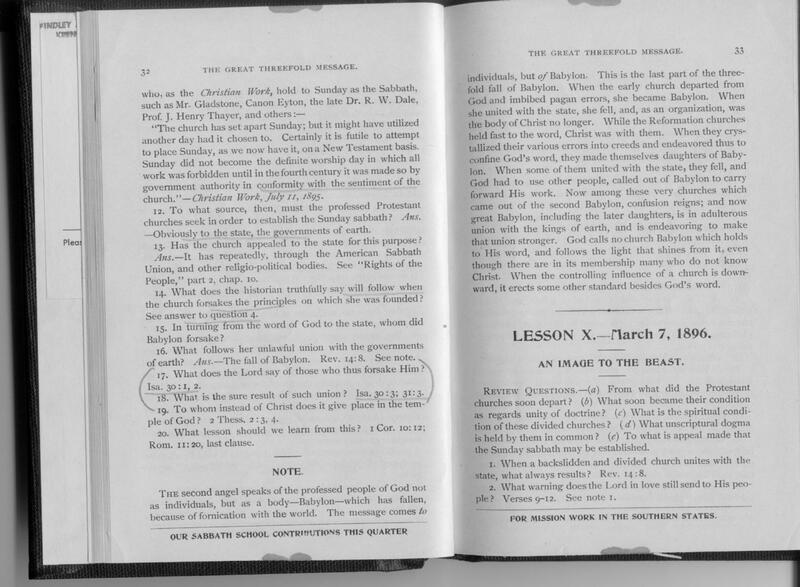 Some of these churches failed to advance, and God called out others to bear His gospel to the world such as the Baptist, Methodist, Congregationalist, Disciple, Adventists. His last 'called-out' people will know no standard but His word, no power but His Spirit." All emphases of font color, and bold supplied at this site. "3. Why did Babylon fall? Ans.- Because of rejecting Christ and fornication with the kings of the earth. 5. What does the term as here used symbolize? Ans.- An apostaste church." "The church turned from the Lord and sought power of the state. She left her lawful spouse and committed fornication with the kings of the earth. Compare 2 Cor. 11:2 with Rev. 14:8; 17:2. This was the last step in her separation from Christ. Out of this came persecution of those who did not subscribe to her creed."